Decided to lift the playfield to have a look, just to see if anything stood out as unusual. Visual inspections are cheap and easy, and other than needing a light, you can’t really hurt anything (as the power is off.) Noticed indeed the right slingshot coil looked rather “baked.” In fact it was so cooked that the plunger would not move inside the coil. Decided since the playfield was up, to replace that coil. No matter what it will need to be replaced, so just decided to do it first. Next went up to the backbox to check things out. 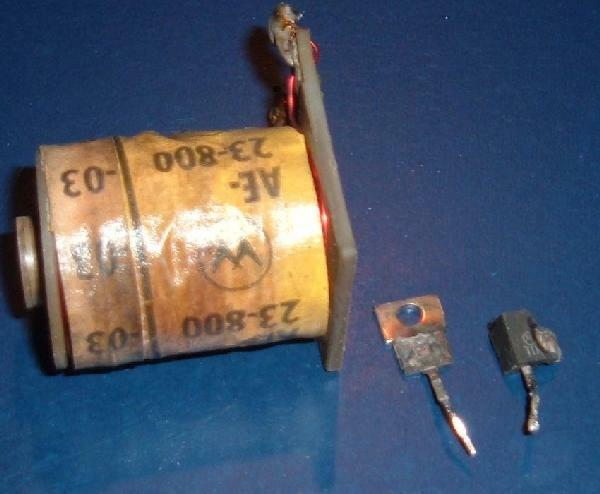 There are two coil fuses in this game – one for the low voltage 30 volt coils, and another for the high voltage 50 volt coils. In the picture below the blue arrow shows the 30 volt coil fuse, and indeed it was blown. That’s why the pop bumpers and the slingshots didn’t work. Apparently when the slingshot coil locked on, it did blow the fuse. 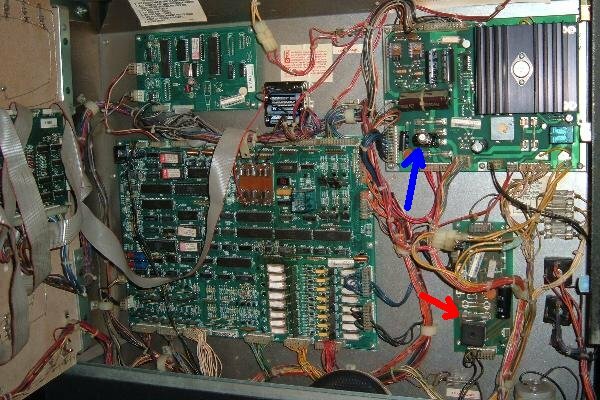 The 50 volt fuse (red arrow) controls the kickers and flippers (which did still work.) Examined the blown fuse and found instead of a 2.5 amp slow blow fuse, it was a 10 amp fuse. This is why you don’t want to over-fuse. If the game had the correct fuse, the slingshot coil probably wouldn’t have melted and burned. 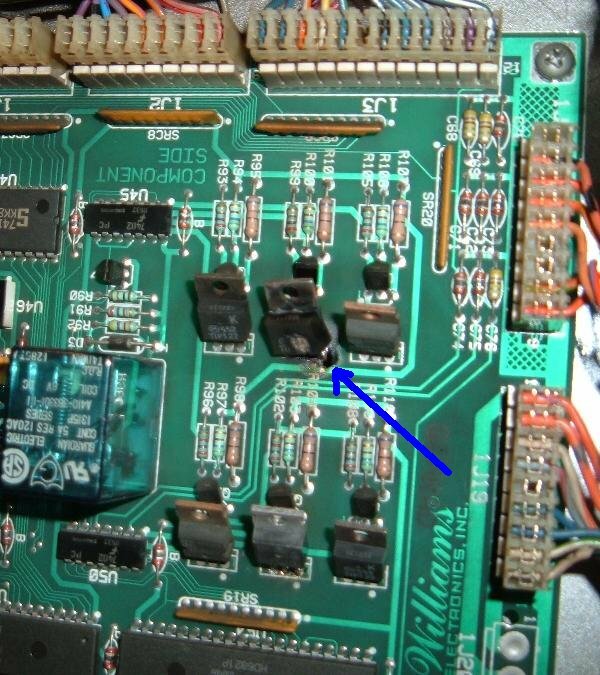 Knowing the slingshot was a “special solenoid”, went to the SS portion of the CPU board to see what damage may have occurred. Sure enough, one of the TIP transistors was baked. Turns out since the game was over fused, this TIP transistor became a fuse of sorts, and pretty much melted and cracked. We replaced this transistor with a new TIP102. Tested the pre-driver 2n4401 transistor and found it to be good, but replaced that too for good measure. 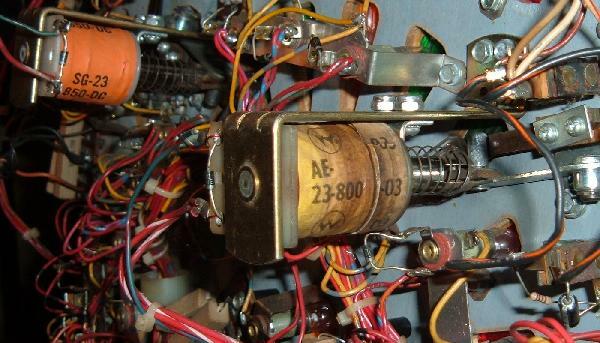 With the new coil and new transistors installed, and a new 2.5 amp slow blow fuse in place, did not yet turn on the game. Instead checked the right slingshot switches to make sure they weren’t bent closed. They looked good, needed only minor adjustment. Powered on and everything now worked, including the right slingshot. Below is a picture of the crispy parts. Wow that transistor sure did cook. Resistance on the burnt coil was near 0 ohms too (instead of 3.5 ohms), so that coil had become a dead short. The big question is why did this happen? 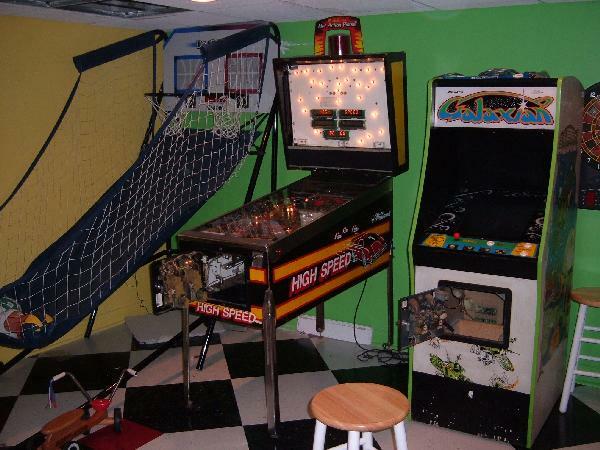 Well on Williams system11 games from this era the slingshots and pop bumpers (the “special solenoids”) are *not* one-shot coils. That is, if their activation switch gets stuck closed, the coil will lock on and stay on until something cooks. That something could be a fuse (hopefully), or something more severe and costing more time and money. Since the slingshot switches on this game seemed OK, we suspect the TIP transistor itself shorted internally (for no particular reason), and then proceeded to melt the corresponding coil.